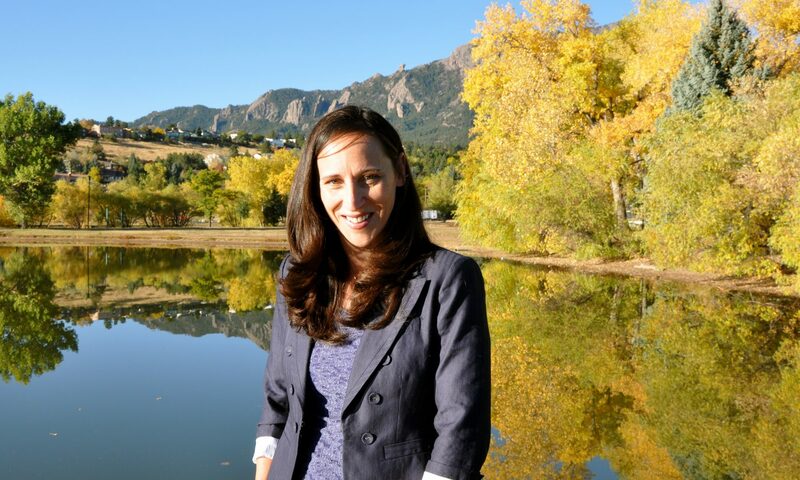 Adolescence – Shelly D Mahon, Ph.D.
More often then not we associate risk-taking behavior in teens as negative or harmful. However, we know that the teen brain is literally wired to take risks. Therein lies the dilemma. We are left with the belief, or fear, that our teens are going to take risks that could have serious consequences. I would like to offer a different perspective. If we know that our teens are naturally going to engage in experiences that give them an adrenaline rush, why not provide them with opportunities to have that rush in an environment that promotes positive youth development? When you really think about it, don’t we all develop new skills and competencies when we put our selves out there and take a risk? Now, I am not suggesting that you encourage your teen to be dangerous or unsafe. Rather, I am suggesting that you literally set up opportunities for them to take positive risks. Social risks: For some teens, it is risky to speak out in a group. If you have a quiet or reserved teen, it may be enough to encourage them to take a leadership role in something like student counsel or a local youth group. Physical risks: Some teens find satisfaction in taking risks on the field. This may be through school or community sponsored sport teams. Not only can sports be good for team building and leadership development, they expose young people to adult role models. Other physical risks: Not all teens like team sports. Some may prefer to take up skateboarding, mountain biking, skiing, rock climbing, white water rafting, or surfing. Of course, they need to have the right equipment and safety training. These activities develop initiative and personal discipline. Political risks: Some teens are passionate about making a difference in their community. They may like writing their local congressman/woman, voicing their opinion on debate team, or participating in community activist or youth governance groups. Creative Risks: Teens can express their creative juices in a variety of contexts. Some may take an interest in the drama team or the school choir. Others may like playing guitar, reading poetry, or reciting spoken word at the local coffee shop. Either way, this kind of expression can take some serious guts! Not only do these activities give young people an opportunity to develop a specific skill, they teach them to be competent in public speaking. Competitive Risks: Give your teen a chance to compete if they are inclined. They can learn a lot, regardless of whether they win or lose. If your teen does lose, treat it as opportunity to teach that we all lose at some point. Losing a competition does not make him/her a failure. It simply means there was a lack of performance. We have to do everything we can to keep our teens physically and emotionally safe. But, we also have to give our teens a chance to take risks, learn about themselves, and develop skills and competencies that help them accomplish what they want in the world. Experts say that when teens have opportunities to take positive risks, they are more inclined to avoid the negative ones. Think about our great leaders. People like Martin Luther King Jr., Mahatma Gandhi, and Abraham Lincoln did not have the impact they had on the world by sitting back and being careful all the time. I would like to leave you with some of my favorite quotes from Abraham Lincoln. As you read them, take a moment to consider how you can share these with your teen, or even be the example of how they are expressed in the world. One of the greatest things about teenagers is the wonder, passion, and intensity through which they see the world and live their lives. They are curious, thoughtful, and dramatic. For many teens, music becomes a major way to express themselves and feel through their emotions. The love struck teen makes a playlist of love songs. The heart-broken teen listens to sad songs to get through loss. The athletic teen listens to music to get pumped up for an event. The happy teen blasts music and sings along. Teens are not afraid to dance to music in the rain, or play it loudly throughout the house and from the car. The massive increase in technology certainly presents challenges for parents. However, technology can also help you stay connected to your teen. The important thing is that your teen learns to protect his/her online identity, and that you guide and monitor their use. YouTube is very popular site among teenagers. With YouTube, teens can listen to any song they want and create playlists of their favorites. You too can create a YouTube account, and subscribe to your teen’s playlists (as long as your teen has made them public). I personally have a YouTube account, I subscribe to my teens lists, and I mine through their music. You may or may not like the same kind of music your teen likes. But, there are a number of reasons to tune in! 1. You Can Use Their Music To Express Your Feelings For Them. I came across the following song while looking through one of my son’s YouTube playlists. It says so much about the relationship I have with both of my children. It also says a lot about who I want to be for them. One line in particular says, “You can ALWAYS come home”. I gave both my teens this song and told them it made me think of them. Sometimes, it is the simple things that say I LOVE YOU! 2. You Can Learn About Your Teen. The music your teen listens to can reflect his/her interests. Songs communicate a range of experiences, beliefs, and desires. While it can be easy to be concerned by some of the lyrics, don’t get stuck there. Teens often overlook the negativity and stand in the values you have taught them. Depending on your teen’s age, lyrics may even go over their head. Knowing what your teen is listening to can be the first step in having a conversation about what you think. 3. Music Creates Relationship Through Commonality: I once heard a dad tell a beautiful story about reconnecting with his son by taking him to a Metallica concert. He was excited to share that the silence that was present on the way to the concert was non-existent on the way home. In fact, his son talked his ear off, not only about the concert, but about all kinds of other things that were going on in his world. The father was proud of himself for being able to sit through the whole concert, even though he preferred classical music. He told his son that “they were not as bad as he thought they would be”. But, he left out the part about wearing earplugs the entire time. The point was never to fall in love with Metallica’s music. It was to spend quality time doing something his son loved. 4. It Gives Your Teen An Opportunity to Share: Being a teenager can be like living in an entirely separate society. Our culture even perpetuates this by using terms like “youth culture”. The concept of a “youth culture” is that teens live by their own set of rules, roles, and responsibilities, which separates them from adults. This separation can as teens feeling like adults are always telling them what to do. When you show an interest in their music, you are giving them an opportunity to share a little piece of them. They are left feeling like you are interested in them. 5. It Helps You Understand What They May Be Going Through: If you pay attention, music can cue you into what is going on in your teen’s life. You can use a song to start a conversation, or to show that you are interested in them or what they are going through. You can also use song lyrics as a teachable moment. For example, rather than sitting down at the table to have a conversation about drinking alcohol, use the lyrics from a song to generate a two way dialogue. 6. It Keeps You Current. Teens like it when adults understand their world. Whether or not you actually like their music, it makes them feel accepted for who they are if you know something about it. Parenting teens is never a popularity contest because we must always be present to protecting, coaching, and disciplining. Knowing their music can, however, up the “Cool Factor“. It is natural to put a lot of energy into the transition back to school. Don’t forget that it is just as important to develop good habits throughout the entire year. Consider that many of the things that you do on a day-to-day basis are not well thought out decisions, but habits. This is as true for your teen as it is for you, and can have a big impact on how well your teen does in school. My teen is already behind! I feel like all I do is nag! My teen seems stressed out! New routines or habits are established in the first few weeks, and can impact on how or what your teen does in school. Don’t forget that it is just as easy to develop good habits, as it is to develop bad ones. Without some consideration, we can even absent-mindedly fall back into old habits. If you notice that certain things are not working, it is time to reprogram that habit! How are habits formed? Neuroscientists have traced our habit-making behaviors to the basal ganglia, the part of our brain that plays a major role in the development of emotions, memories and pattern recognition. Decisions, however, are made in the prefrontal cortex. This portion of the brain helps us think through situations with logic. Once a behavior becomes a habit, it is automatic and the prefrontal cortex goes into a sleep mode of sorts. When does a behavior become a habit? In the book, The Power of Habit: Why We Do What We Do In Life and Business, Charles Duhigg attributes habit formation to what he calls the habit loop. Even though this book was written for businesses to boost effectiveness, the concepts in the book are easily applied to individuals and families wanting to create habits that increase workability and success. The habit loop is made up of a cue, a routine, and a reward. Cues trigger the behaviors that we engage in for some kind of reward by kicking our brain into automatic mode. These cues can be internal, such as thoughts or feelings, or external such as time of day or spending time with a particular person. Routines are the behaviors themself. Routines can be physical (having a snack when you get home), cognitive (remembering to do homework), or emotional (feeling anxious). Rewards are the things we like that help are brain remember the habit loop in the future. Our behaviors become automatic when we crave the reward. Like routines, rewards are also physical (I’m no longer hungry), cognitive (I gained new information), or emotional (I feel more relaxed). What are your habits? It can be helpful to look at your own habits before you evaluate your teen’s habits. What is the first thing you do when you get up in the morning? Do you walk half awake to the kitchen and make coffee…staring at the machine until the coffee comes out? Do you crawl out of bed and get straight into the shower? Regardless of your answer, it’s not likely this is something you decided to do; it’s a habit. Now, whether you make coffee or take a shower first probably doesn’t make a real big difference in how your day goes. However, other things like whether you go for a run when you get home from work, or eat dinner in front of the television can have a bigger impact on how you live your life and your overall health and well being. Believe that change is possible and within his/her control. This can be challenging when many things are black and white to teens. You may have to help your teen generate options. Next, listen for and ask questions that get them talking about change. Asking questions like the ones below can help draw out the meaning your teen gives a particular change. Desire: Why would you want to make this change? Ability: How would you do it if you decided? Reason: What are the three best reasons? Need: How important is it? and why? Commitment: What do you think you’ll do? Using our example, a teen may say things like, “I want to finish my homework quicker so that I have more free time!” or “I could tell my friends to text me after 6:00.” Or, you could ask questions like, “How important is it to you to get your homework done quicker?” or “Why do you text your friends while you are doing homework.” Asking these kind of questions can also give you more information about the rewards for certain behaviors. Having a conversation about what is not working, and giving your teen a voice in the decision can be empowering. When your teen is empowered, he/she is more likely to cooperate and create workability for you and your teen. Remember, the more you’re your teen wants to change the more likely it is to stick! What’s Going On? My Teen Seems So Far Away! Think back to your own adolescence. Were there certain things that you really didn’t want to talk to your parents about? How did you decide what to share and what to keep to yourself? The truth is, most often teen are not trying to be devious or dishonest; they are simply in the process of separating themselves from their parents. While it is important to remember that this individuation is part of how teens develop their identity and become their own person, it is also important to remember that sometimes you have to interject yourself into their world to keep them safe and healthy. This requires paying a lot of attention to what is going on in your teen’s life. Everything from school, friends, and activities to feelings, moods, and actions is important. You know it is time to intervene when you sense that something is wrong, or suspect that your teen is holding something that could put him/her in danger. Certainly, too much distancing can have other negative impacts on your relationship by removing opportunities to share and connect with one another. Remember that giving your teen space is not the same as staying out of the way completely. Even though increased independence can reduce the amount of one-on-one time you have with your child, it does not have to translate to zero time or poor communication. Part of parenting is being able to find the balance between giving children room to grow, while also establishing a safe environment with rules for behavior that match your beliefs and values. The difficult part of this life stage is that these changes take place at the same time that your teen requires lots of guidance and monitoring to navigate new freedoms and opportunities. Teens need continued structure, attention, reassurance, and love from their parents as they try to find their way. Often times, your life experience will help you to recognize when your child needs you. Remember, sometimes teens will push their parents away so that they will pull them closer. Let your teen know that you pay attention because of your love and your ability to use the knowledge, experience, and the resources you have gathered over time to help them grow and develop. Your teen will be more likely to share with you when the message is “I can help you” versus “You are going to be in trouble”. Finally, don’t take it personally when your teen is quiet and distant. Focus on taking advantage of the opportunities you get to make connections and show interest in them. If these opportunities do not come frequently enough, create the space you need to interact in such a way that you have more opportunities. The virtual world we live in, and the ease with which teens use cell phones and other technology, opens up new doors for connection. Regardless of your means of communication, reaching out to your child says, “My mom/dad thinks of me. My mom/dad loves me”. Staying in touch while being compassionate and understanding of your teen’s need for independence can go a long way in building understanding and trust between the two of you. Share aspects of yourself with your teen. This can prompt your teen to share in return. Be creative about how you interact with one another. Find ways to communicate regularly. You may have to schedule something a trip to the coffee shop on the way to school or a weekly lunch outing. Make your communication engaging by talking about things he/she enjoys. Help your teen see that you are not prying or snooping, rather you are interested in who they are as a person. Take personal responsibility for creating a loving relationship with your child. Making your teen feel like he/she is responsible can backfire, or make your child feel burdened with guilt, uncertainty, and/or sadness. If you feel it in your gut, there is probably something going on that you need to know about. Your knowing could keep your teen safe, or give you an opportunity to you’re your teen make an informed decision or better choice. Don’t be afraid to be up front with your child about your concern. The Adolescent Brain: What Stays? What Goes? The brain is a powerful and mysterious thing! It is functioning all of the time, day and night. Certain parts of the brain even have multiple pathways to perform the same task……just in case something goes wrong. There is an entire body of science looking exclusively at what our brain does when we are sleeping. Another body of science examines how the brain changes during childhood, adolescence, and adulthood. And another body of science looks at how brain activity is linked to social behavior. In fact, one of the most fascinating developments in social science research is that we now have empirical evidence to explain actual behavior. For example, there is evidence that certain areas of the brain develop 3 years slower for those diagnosed with ADD than for those without ADD. Some have said that we only use 10% of our brain. This is a myth that was perpetuated out of the work of Karl Lashley in the 1920s and 1930s. He found that when sections of a rat’s brain were removed, the rat would relearn certain tasks. Now we know that the removal of even small areas of the human brain can have devastating effects on behavior. It is more likely that we use 100% of our brain, but only use portions of the brain at any given time. 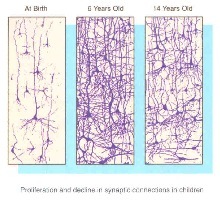 As you can tell from the pictures above, the number of synapses decrease between 6 and 14 years of age. We call this the “Use It or Lose It” phenomenon. Here’s the way it works. At 1-year of age, the human brain has twice as many synapses than an adult brain. This is because the brain produces many more connections among cells than it will use. The developmental task of the childhood years is to prune and select the most useful, or perhaps the most used neurons, synapses, and dendrites. This pruning continues into the early teen years. The important thing to notice is that more is not better. Think about all the different ways you can go from one location in town to your house. Maybe you tried several different paths when you first moved into your house. However, over time you learned that one route was faster than all the others. From that point on, you always used the same route. This is exactly what is going on in the teenage brain. Overtime, your teen’s brain gets more efficient by establishing the best, most direct pathways and getting rid of the others. Brain structure – certain parts of the brain are smaller in childhood than in adolescence, while others are larger. Brain junction – adolescents use different parts of the brain than children to perform the same task. Interconnections – various regions of the brain establish good communication with other regions. For example, the regions responsible for logical reasoning become better connected to those responsible for emotion. When this happens, the two regions talk to one another, allowing for better self-regulation. Response to peers – peers activate the reward center of the adolescent brain. That means that teens are more likely to take risks in the presence of their friends, especially when they believe their friends will reward them for their choices. Interestingly, they have not found these same connections when teens interact with adults. Be inconsistent. Outside of the fact that they are trying new things on, different parts of their brain are in different developmental stages. Learn from his/her experiences. Thinking ahead and controlling impulses improves by having exposure to a variety of experiences. Discussion around why the world works the way it does is also important. Need practice – Encourage your teen to plan, anticipate consequences, and regulate behavior. Practice with your teen whenever you get a chance. It will not work all the time, but it will work sometimes. Get emotional – Because the teenage brain floods the body with dopamine, teens often respond more quickly to things that spark emotions (like a friend in need) than they respond to less emotional things (like a math test). This doesn’t mean you should let your teen spend his/her entire evening with friends instead of studying. However, it does highlight the importance of acknowledge your teen’s feelings and allowing him/her to express emotion. It is easier for teens to move onto other things after they have dealt with their emotions. When you are trying to understand your teens choices, sit back and consider: What’s their experience? How would they know what their choices/options are in the present situation? What else is going on in my teen’s world that could be prompting a certain response (ex. issues with schoolwork, friendships, activities, and/or family). As often as you can, take advantage of the opportunities you have to expand their understanding of the world. Above all, hang in there…..they do get smarter over time! How Do We Help Our Teens Be Achievers in Life? There is no shortage of information, movies, and opinions about student achievement. Some talk about how to compete in a global economy. Others talk about the increased use of strategies such as cheating or using drugs like Adderall to improve performance. Still others talk about how to promote achievement in a healthy way. Recently, I read an article summarizing a study referred to as “The Berlin Study”. During the 1990’s, psychologists from the Universität der Künste examined violinists to determine who the highest achievers were and why. Fascinated by the findings, I read the article, “The role of deliberate practice in the acquisition of expert performance” that was published in the Psychological Review. They came up with some very interesting findings. I think these findings are applicable to how we help our teens perform to the best of their ability. One of the biggest findings challenged the idea that some are innately smart or talented in a certain area. Now, this is not to say that some teens are not more inclined to like athletics, music, or academics. However, they noted that to be truly gifted at something required practice and dedication. Often times, those that were considered “elite” had been engaged in the activity for at least 10 years. This is consistent with more recent reports that doing well in school has more to do with effort than it does natural ability or intelligence. The larger group of musicians was divided into “elite” and “average” players. From this they gained some interesting insight on what separated the two groups. They practiced the same amount of hours. The difference was in how they spent their time. The elite group spent an average of 3 1/2 hours per day on what they called deliberate practice. This meant that they did uncomfortable, methodical work that stretched their abilities. The elite group also practiced in large chunks of time – once in the morning and once in the evening. The average players spread their work throughout the day. The elite group was significantly more relaxed, less stressed, more rested, and engaged in more leisure activities. This is not to say that there are not individual differences in a person’s ability to multi-task or manage stress. However, there are some interesting implications for how we teach our teens to study and build skills. Let’s look at what all of this means. First, doing work that pushes you may not be fun at the time, but it provides for a bigger increase in skill. So, the same work is easier the next time. Seeing improvement leads to increased satisfaction and motivation to keep working. For our teens, this means being persistent, even in the face of challenge. It also seems as though doing something for larger blocks of time allowed the students to get into a groove. You could say that their brain fired faster or they were in a “flow”. In short, the work they were doing was more effective than work that was constantly interrupted. When work was spaced throughout the day, the students wasted some of their time getting back into the activity. For our teens this means that distraction and interruption can be a huge barrier to being an effective student. Changing music, checking Facebook accounts, or texting friends may mean (1) taking longer to complete the work and (2) getting less out of it in the end. Finally, spreading work throughout the day can leave a person in a constant state of busyness, stress, and exhaustion. This results in our teens thinking about what needs to be done when they should be sleeping, or even while they are working on something else. They may not have as much time for leisure activities because they are worried about having time to get everything done. This means that our teens could benefit from separating their school work, activities, time with friends, and time for television, games, or social media into distinct blocks of time throughout the day. While we are talking about these strategies as they apply to our teens, you may find that they work for you as well! The Search for Identity: Who Am I? What Am I Committed To? What Am I Afraid Of? What are three things that you are committed to? What are you afraid of and why? Now, think of the world of a teenager. How would your teen describe him/herself? Putting some thought into this can give you new insight into your teen’s identity. Children typically describe themselves using specific adjectives. Seven year old Johnny may say, “I am kind and funny” and nine year old Suzie may say, “I am talkative and nice.” This changes in the teen years. Fifteen year old Johnny can see that he is kind sometimes, and unkind other times. He can tell you that he is funny when he hangs out with his guy friends and quiet around girls. Similarly, 17 year old Suzie can tell you that she is talkative around people she knows and quiet in new situations. She can articulate that she is generally nice, but can be mean when she is tired. How teens describe themselves is an aspect of their identity and one that becomes more and more sophisticated as their brains develops. What three things were you committed to? What do you think your teen is committed to? This is important to consider because our identity is also built on the things we do. A teen that is committed to daily swim practice defines herself as an athlete, a teen that looks for a job at 16 sees himself as hardworking, and a teen that volunteers at the humane society describes herself as an animal lover. If you think about what your teen commits to, you can link it to certain characteristics that make up their his/her personality. Adults can relate to this. What is the first thing you tell someone that you just met? Do you say where you work, tell them about your children, or mention your favorite activities? Like teens, these are parts of you that you are committed to and enjoy sharing with other people. All teens have fears. They may be afraid of looking bad, saying or doing the wrong thing in a social situation, or doing poorly on an exam. The impact of these fears can be compounded by their inability to distinguish their thoughts from the thoughts of others. For example: If a teen thinks her hair looks bad then she also thinks that everyone else thinks her hair looks bad. All this thinking about what other people are thinking can be really exhausting! Fears impact identity development by inhibiting a teen from trying new things and making new commitments that build competencies and esteem. Pay attention to how teens describe themselves. Tell stories that are rich with characteristics you have observed. Your teen may choose to add these to how he/her description. Engage teens in conversations about the things they like to do. Help your teen explore new areas. Remember that independence bread confidence. Find safe opportunities for your teen to express his/her independence and develop new competencies. Make a big deal out of their accomplishments. Verbalize the things you see working for your teen in different situations. Recognize that experimentation is normal. A big part of your role is to pay attention and reel your teen in with clear about boundaries, expectations and consequences. After many moves and years of hanging onto “keepsakes”, the Smiths are cleaning the basement in preparation for a garage sale. The two kids have been told that they can keep part of the profits if they help with both the preparation and sale of the items. The day before the garage sale, mom approaches her teen. “I have a couple important meetings at work today and I could really use your help finishing up the pricing of the things in the garage. When your sister wakes up, can the two of you please try to finish that up so that we are ready for this weekend?” Keep in mind that even though the kids have helped, mom has really done about 80% of what it has taken to get ready for the garage sale. Her teenage daughter responds with, “Can’t we just work on it together when you get home? I am really tired and I haven’t seen my boyfriend for a week. I was planning on sleeping a little longer, catching up with some friends for lunch, and then hanging out at the pool with John for a couple hours. As you can imagine, this doesn’t go over very well. Mom is instantly annoyed, frustrated, and overwhelmed with all the responsibilities she has that day. At this point, mom looses it a little. She replies with, “All I am asking you to do is price a few things. With both of you working, it shouldn’t take more than an hour out of your day. I am glad to see you taking care of yourself, but it would be nice if you could contribute to the family a little more.” The teen responds with, “Maybe you should take care of yourself a little more. If you took time to get some rest and have lunch with friends, you would be a lot happier and more fun to be around!” Mom decides not want to engage in what was quickly becoming an argument. She walks away, telling her daughter she will check in with her again before she goes to work. What comes up for you when you read this? This mom may be asking herself things like: When did my teen stop asking if she could do something and start telling me what she is doing? How can she say such hurtful things to me? Doesn’t she understand what would happen if I just decided to take the day off every time I needed to “take care of myself”? Why can’t she see all the things I do for her? Teens like the one above can be very egocentric. To be egocentric is to think only of oneself, without regard for the feelings or desires of others. This explains why teens see the world through their own eyes, basing choices on their personal priorities and limited experience. As challenging as it can be for those around them, being egocentric is a necessary characteristic of identity development. Typically, teens will move in and out of being able to see another person’s perspective, and they will practice this new skill on you! Often times, it is not they they are trying to be mean or hurtful. Rather, they simply are not focused on how they are making you feel. Disengage: Engaging in an emotional dialogue with a teen is like being in an arena with a matador. The matador tries to wear out the bull and the bull runs around chasing a red cape. Meanwhile, the bull gets more and more upset and exhausted. If you are inclined to react, walk away and come back to the conversation when YOU are ready. When you are ready, restate your expectation. Keep it simple and direct. Describe, specifically, what needs to be done to meet that expectation. Share how their contribution benefits their family or community. When you resist the temptation to get in the arena with the matador, you can be more skillful in your interactions. Using situations like the one above as coachable moments allows you to make a positive contribution to both their sense of self and their growing understanding of who they are becoming. Sharing how their efforts make a larger contribution can help build positive self-esteem in teens. The word ‘esteem’ comes from a Latin word that means ‘to estimate’. So, self-esteem is related to how teens estimate, or regard, themselves. Experts suggest that it is through their contributions that teens develop skills and regard themselves as capable. They begin to recognize that they play an important role in reaching a larger goal. It also helps them to be less egocentric as they begin to see how their actions impact people outside of themselves. I have heard a lot of parents say, “Being a parent has taught me how to be a better person.” Why is it that our children are often the ones that push us to grow as individuals? What does it look like, to be a better person? Parents tell me that they became a better person because parenting inspired them to be more patient, authentic, observant, and aware of themselves. Many shared a commitment to self-improvement. A friend of mine once said, “teens need us to protect them from themselves.” We enter the world of parenting with an huge sense of responsibility, and we learn very quickly that our children will look to us as models for what it means to be human. Teens need our guidance to stay safe, be thoughtful, live with purpose, develop work ethics, show compassion, and engage with others in a way that shows they can take responsibility for themselves and for their contributions to the world. The following video is not just about parenting a teen, it is about what the author, Brene Brown, would call being whole hearted. She keeps it light and funny as she talks about what it is like to live life with courage and to accept that we are all vulnerable and imperfect. She reminds us that being a “good parent” is not about having perfect teens, it is about having teens who feel worthy. This video is longer than what I would usually post. However, I think the next 20 minutes will be well worth your time. You might even find yourself watching it more than once! I would enjoy hearing your thoughts and comments after viewing this video. How did you relate to what she shared? How does all of this apply to our parenting? Sometimes a little humor can go a long way! This last weekend, one of my counseling students shared this video with me and it made me laugh. It also made me think of raising teens. When I returned home, I shared this video with my own two teens. Jokingly I said, “Should I give this technique a try at home?” They both laughed and said, “As long as we can use it too!” I suspect there may be times in the future when we pull this one out of our bag of tricks just to lighten things up a bit! On a more serious note, it is not uncommon for parents of teens to want their teen to just listen and do what they have asked them to do. Have you ever wished you could just say, “Stop It!” and your teen would just stop; stop leaving lights on in every room, stop hanging out with someone, stop leaving their bike outside all night, stop procrastinating in school, or stop coming home late. Of course every teen is different and every parent faces different challenges in helping their teen develop into a thoughtful and responsible young adult. The problem is that as teens get older, they need to develop their own identity, one with the values, beliefs, and self-expression that is uniquely theirs. This helps to explain why “Stop It!” by itself doesn’t work. Sometimes we have to see certain situations as learning opportunities, ones in which teens can make their own decisions and live with the consequences. Other times, our teens need us to hold a hard, firm boundary and say “Stop It” or “Absolutely Not”! Experts say that the most effective style of parenting is one that combines clear rules and expectations with being responsive, warm, and nurturing. Using this style results in teens who grow into happy, capable and successful adults. This may sound logical, or even easy to implement. The problem is that we don’t respond to situations like robots or machines. In actuality, we are a lot more thoughtful about how we respond and we don’t always get it to right. But, how can this be when the suggestions for “effective” parenting are so clear and our intentions are so genuine. Let’s look at some of the things that influence how we, as parents, handle different situations. We are emotional beings. Because our teens are one of our most important investments, we want to do it right. This desire can lead to being too harsh on our teens and then overly critical of our parenting. We have experience. We want to protect our teens from the things we have learned from our experiences. This inhibits teens from having their own experiences. We assign meaning. We interpret situations and believe that our interpretations are the “truth”. This leads to making assumptions instead of asking our teen to share with us. We speak from our perspective. We talk to them as if they have the same knowledge and understanding we have of the world. We wish that we could impart our knowledge on them, while our teens want to figure it out themselves. We want their love. We want a close relationship with our children. This can lead to protecting them, rather than letting them live with the natural consequences of their choices. We get busy. Sometimes when our teens need our attention the most, we are distracted or too busy to listen. This can lead to having less communication, or even feeling disconnected from our teens’ lives. The end goal is to be nurturing and responsive at the same time that we establish clear rules, guidelines, and expectations for appropriate conduct. But, it is important to remember that knowing this doesn’t mean that it will be easy. There will be times when we feel as though we have been too harsh or not harsh enough. Focus on “getting it right” as much as you can, and practice being patient with yourself. If you find yourself being too critical of yourself, just “Stop It!” Focusing on the past doesn’t allow you to move forward.